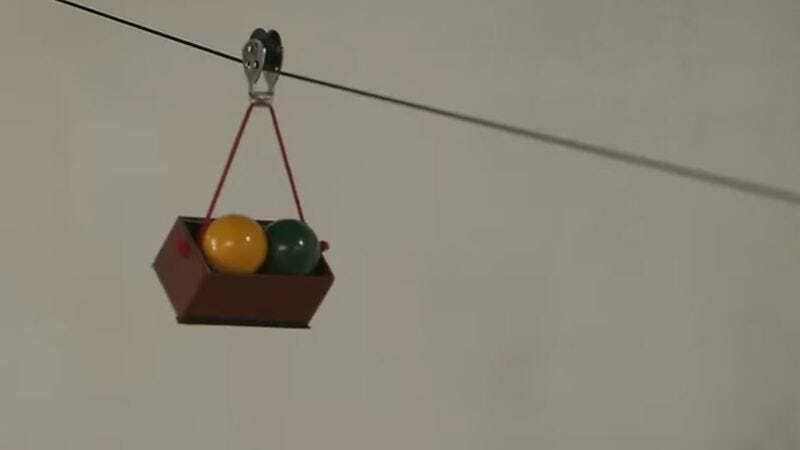 There’s just something magical about a good Rube Goldberg machine—you know, those delightfully elaborate contraptions that take a bunch of complicated steps just to perform a single, simple task. The Japanese children’s show Pitagora Suitchi, which translates to Pythagoras Switch, found a way to make them even more awesome: use one to tell an adorable, thrilling musical adventure. Specifically, this is the story of Biita and Biigoro, two balls that set out to rescue their brother, Biisuke, from the evil black balls’ trap. The whole scene is presented as a whimsical stealth mission, complete with cute musical narration that has been helpfully translated in this video. As the show’s host mentions, this is actually the sequel to an earlier segment. The original tells a similar story with a similar song, only that time it was Biisuke who had to venture out alone and rescue his brothers.